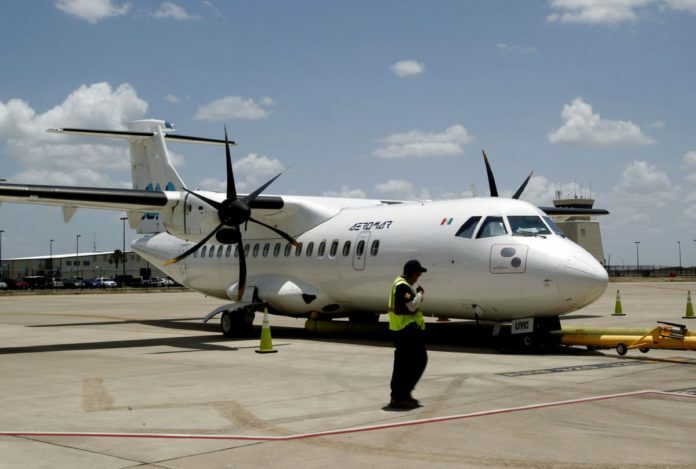 MEXICO CITY — Fall foreshadowing might prove true as Aeromar, the Mexican airline that links McAllen to Mexico City, considers its future. Aeromar, which flies daily between here and McAllen, increased its passengers by 29 percent and revenues by 30 percent in 2017, according to its commercial aviation director. Executives and city officials said the McAllen route was especially strong the last quarter of 2017 and the first half of January. It helped that McAllen spent more than $20,000 on marketing here last year, which paid off, according to René Giesemann, Aeromar’s commercial director. McAllen Aviation Director Liz Suarez projected 2018 to be the strongest year yet for the Aeromar flight, which has existed for nearly five years. Last year, Avianca, the popular airline in South America that is the national carrier of Colombia and part of the Star Alliance Network, purchased a 49 percent stake in Aeromar, which only flies domestically in Mexico. Its one international route is to McAllen. That possibility now seems more likely, which is why Aeromar is holding off on running a strong marketing campaign in the Valley. But passenger loads have remained steady, Giesemann said. It helps that the airline has a partnership with United Airlines that it didn’t push as heavily in the past, but has been recently. Passengers flying Aeromar get miles toward the United Airlines Mileage Plus program, and all the amenities that United frequent fliers receive, such as lounge access. In addition to the United partnership, Aeromar has 15 inter-airline agreements with major carriers across the globe. These make it so passengers can purchase an Aeromar ticket and get many places. If, for instance, a prospective German passenger wanted to explore surfing on Mexico’s Pacific coast, it’s possible to get one ticket. The surfing demographic has become popular for Aeromar. “We have become experts in transporting surfboards,” Giesemann said. Or, if a McAllen resident was interested in traveling to South America, that can happen through Aeromar. This connectivity through Aeromar around the world “gives customers the ability to buy one ticket, to check in only once, to not have to pick up luggage and check it in again and to be checked in from their home until their destination,” Giesemann said. While the airline has access beyond Mexico, it’s trying to fortify its existing routes, such as McAllen. The McAllen route has one daily flight, and Giesemann receives requests for more routes, such as a direct flight between McAllen and Acapulco and McAllen and Monterrey. For now, opening new routes to and from McAllen are not in Aeromar’s plans, he said. What’s more likely is potentially adding another daily flight, but only if demand calls for it. Giesemann said the airline “would love” to have two daily flights between McAllen and Mexico City. The current daily flight departs Mexico City at 12:30 p.m., then turns around and departs McAllen at 3:25 p.m. Surrounding airports, such as Brownsville, Harlingen and Laredo are also regularly requesting an Aeromar flight, Giesemann said. But the airline is focused on McAllen.